Every business wants to create professional and accurate estimates quickly. 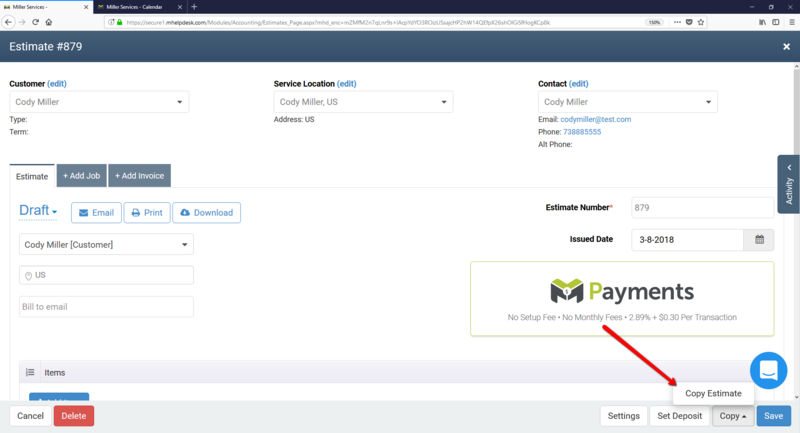 Many businesses use similar estimates for different customers, and mHelpDesk now gives you the ability to copy an estimate and send it to a different lead or customer. You can also easily provide multiple estimates to the same customer for "good/better/best" options to improve your likelihood of winning the job. To copy either a new estimate or an existing one. In this example we will use one that was previously created. 1. Start by using the left navigation panel and selecting Estimates. 2. Select an estimate you have made for a customer or lead in the past. 3. In the bottom right corner, select where it says Copy, then click Copy Estimate as shown below. 4. Once you click Copy Estimate, you will then be prompted to select which customer you want the copy to be linked to. Use the drop down arrow on the left to select the customer you want to attach the email to. You can also change the service location or contact using the second and third drop down boxes. The estimate will now be attached to the customer you chose. This feature will provide you with fast, accurate and professional estimates. If you often complete estimates or jobs that are similar, mHelpDesk just made it much easier!